A new SpaceX crew capsule rocketed into orbit early Saturday on a test flight critical to restoring the nation’s ability to launch astronauts from U.S. soil, after an eight-year pause. 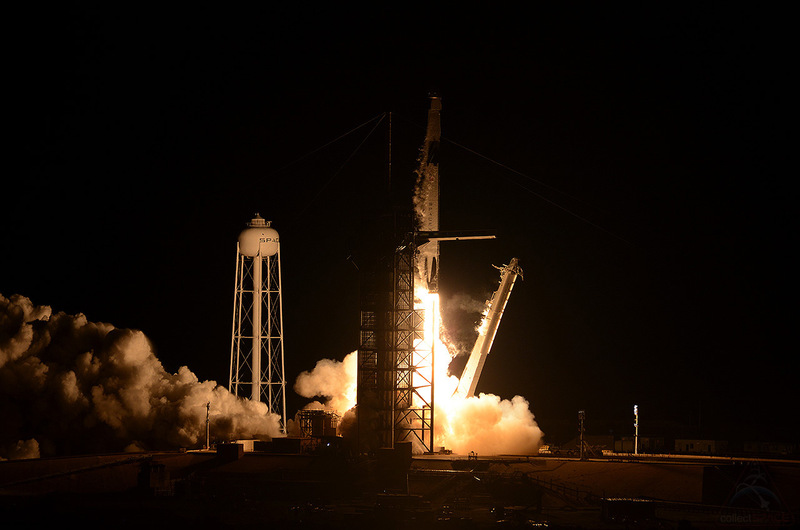 At 2:49 a.m., as crowds cheered at Kennedy Space Center and SpaceX headquarters in California, a Falcon 9 rocket carrying the Crew Dragon capsule thundered from the same pad as the final space shuttle mission in 2011, and Saturn V moon rockets decades earlier. Eleven minutes after liftoff, the capsule carrying a test dummy named Ripley — after the heroine from the “Alien” movies — separated from the rocket to start a daylong journey to the International Space Station. An Earth-shaped plush toy floated inside, weightless. 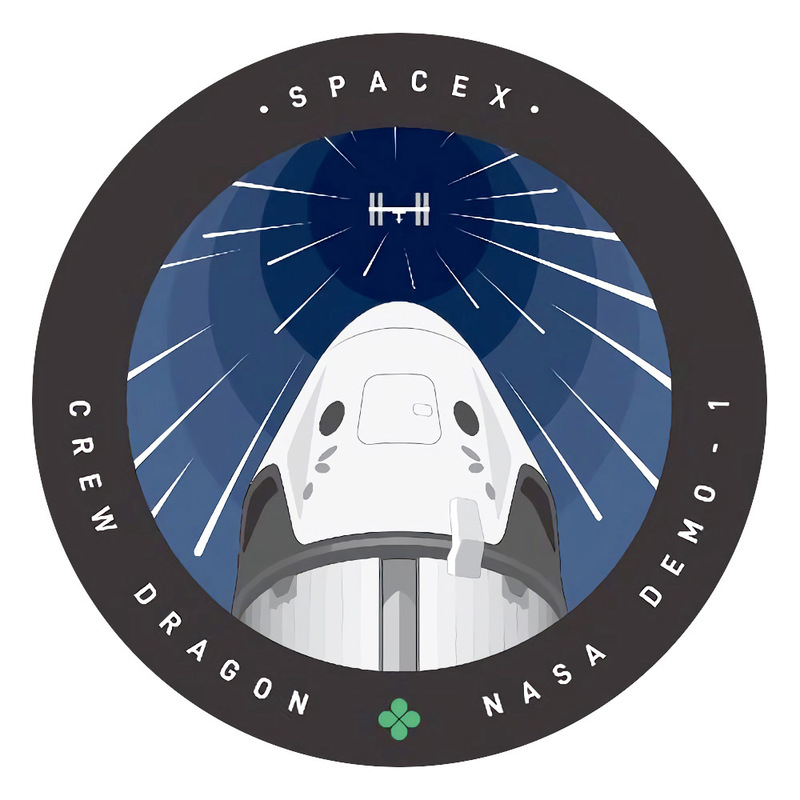 The Demo-1 mission is the first test of the Crew Dragon, and of a new model for flying astronauts that relies on private industry to design and fly the spacecraft. NASA Administrator Jim Bridenstine said the flight represented a new era in which commercial companies like SpaceX would make spaceflight more affordable and accessible. “Tonight was a big night for the United States of America, a great night for NASA,” he said. The Crew Dragon was on course to arrive early Sunday at the space station flying 250 miles overhead. In one of the mission’s most dramatic moments, flight computers will attempt to guide the craft directly into a docking port around 6 a.m., taking care to avoid a collision with the outpost now housing three Expedition 58 crew members. A Dragon spacecraft has never performed that maneuver; older cargo versions are captured by a robotic arm operated by the station astronauts. “That’s certainly going to be something new, that we’ve never done before,” said Musk. Hours later, the station crew will open the capsule’s hatch and welcome its sole occupant, Ripley, and some 400 pounds of supplies and experiments. Wearing a white-and-black suit designed by SpaceX, the mannequin is wired with sensors to measure the temperatures, vibrations and pressures that real astronauts will feel. The six-day demonstration mission anticipates the Crew Dragon undocking and firing thrusters to drop from orbit for Friday morning for a splashdown in the Atlantic Ocean off the coast of Florida. The mission’s goal: to prove SpaceX is nearly ready for NASA test pilots Bob Behnken and Doug Hurley to strap into the capsule for the next test flight, called Demo-2, as soon as July. Behnken and Hurley followed the countdown and launch from KSC’s Launch Control Center, in the same firing room NASA used for Saturn V and space shuttle missions. They planned to hustle across the country to SpaceX headquarters in Hawthorne, California, to monitor the capsule’s docking and later its return to Earth. 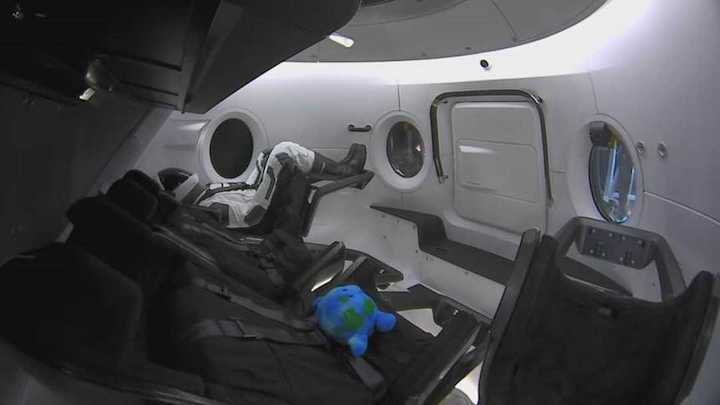 SpaceX's test dummy, Ripley, on board Crew Dragon spacecraft along with plush Earth toy companion for Demo-1 mission, which launched at 2:49 a.m. ET March 2, 2019. SpaceX's test flight is the first for NASA’s Commercial Crew Program, which began partnering with private companies in 2010 as the shuttle neared retirement. In 2014, Boeing and SpaceX won contracts worth nearly $7 billion combined to fly astronauts to the space station, then targeting flights in 2017. Boeing is getting ready to fly an uncrewed test flight as soon as next month, to be launched from Cape Canaveral Air Force Station by a United Launch Alliance Atlas V rocket. A three-person test pilot crew could climb aboard the company’s CST-100 Starliner capsule in August. The crewed test flights will be preceded by tests of abort systems that would enable astronauts to escape a failing rocket any time from the launch pad to orbit. Once NASA certifies their systems as safe to fly, the space agency will tap one of the companies to launch a four-person crew to the station for a six-month expedition. Bridenstine said Friday he was "100 percent confident" that would happen before the end of this year. Delays beyond then could prove problematic, because NASA will run out of seats on Russian Soyuz spacecraft that have provided humans' only ride to and from the space station since the shuttle's retirement in 2011. As a hedge, the space agency has begun negotiating to buy two more Soyuz seats stretching into early next year. But leaders also offered assurances that they won't succumb to schedule pressure to fly before the systems are ready, a problem that contributed to two shuttle disasters that claimed 14 lives. "We definitely won’t launch until we’ve done everything we can possibly think of, that’s for sure," said Musk. "I think this plus the high-altitude abort (test planned in June) gives us a lot of confidence about the actual mission with astronauts." The basic designs of SpaceX's Crew Dragon and Boeing's Starliner hearken back to the earliest flights of astronauts, who launched on top of rockets in capsules that returned to ocean splashdowns. "There’s a reason Apollo and the early space programs came up with this design, because it just works," said Pat Forrester, chief of the Astronaut Office at NASA's Johnson Space Center in Houston. "It was the most efficient way to get to space and get safely back." The winged shuttle, although innovative and largely reusable, was far more complex, with more risks to manage that made it time-consuming and costly to fly, and potentially more dangerous. The Crew Dragon's clean, modern interior bears little resemblance to the shuttles or early capsules that paved the way for it, more resembling a commercial jet. Astronauts will interact with touch screen displays and manipulate only about 30 hard buttons, compared to the shuttle's 2,000 switches and circuit breakers. "It’s an incredibly sleek-looking vehicle from the inside, and it’s very easy to operate from the crew interface perspective relative to what we were used to with shuttle," said Hurley, a two-time shuttle pilot. "It’s just so much more intuitive in this vehicle." One reason for that, Bridenstine argued, is that NASA's new Commercial Crew model gives companies the freedom to design systems that will attract customers beyond NASA. Those could include representatives from other nations or wealthy individuals. "That’s why I think that the capsule has this very different look than those of the past," he said. Saturday's launch gave a boost to Kennedy Space Center, which lost roughly half its 15,000-person work force when the shuttle program ended. Since then, the spaceport has welcomed a more diverse cast of players including new rocket and satellite factories, and excitement is building about astronaut launches coming back. For SpaceX, the Demo-1 mission's positive start and the first launch of astronauts to follow are the latest milestones toward Musk's long-term vision to send humans to Mars. The company Musk founded in 2002 has now launched the Falcon 9 rocket more than 70 times. A heavy-lift version is currently the world's most powerful rocket. Dragons have delivered cargo to the space station 16 times, and now one designed to fly people is on its way. At the same time, SpaceX is designing a mega-constellation of communications satellites and developing a massive new rocket, called Starship, for Mars missions. "It’s been 17 years, we still haven’t launched anyone yet, but hopefully we will later this year," said Musk. "That would definitely be the culmination of a long dream for me and a lot of people at SpaceX, for sure. Can’t wait." The trajectory of the US Crew Dragon spacecraft for approaching and docking with the International Space Station (ISS) has been altered to minimize the risk for both space vehicles to touch each other, Russia’s Roscosmos Executive Director for Piloted Programs Sergei Krikalyov told TASS on Friday. "At the early stage, several trajectory versions were considered and at the final stage a trajectory was chosen that poses the least threat in case of malfunctions," the Roscosmos official said. The trajectory itself did not pose a threat but some technical faults could make the spacecraft touch the ISS, Krikalyov said. Such a probability exists when any spacecraft approaches the orbital outpost, he added. During the docking, the ISS crew will stay in a safe place, the Roscosmos official said. "At the final stage, the spacecraft will fly to dock with the US docking port in the American segment. Several closed hatches will separate the crew and the docking port. Even if something happens, the crew should stay in safety," Krikalyov emphasized. Roscosmos earlier reported that the docking of the US Crew Dragon spacecraft with the International Space Station will be halted, if the rendezvous regime deviates from the normal mode. The US spacecraft is scheduled to be launched to the space station on March 2. The US-based SpaceX unveiled its manned Crew Dragon spacecraft (the Dragon v2 as its other name) in May 2014. NASA and SpaceX signed a $2.6 billion contract in September 2014 on completing the development of the Dragon v2 and certifying it for flights to the ISS. The Crew Dragon is a modification of the Dragon resupply ship, which is already involved in the program of delivering cargoes to the orbital outpost. The manned spacecraft will be launched by a Falcon-9 rocket developed by SpaceX. — For the first time, a U.S.-built commercial spacecraft capable of carrying astronauts is now on its way to the International Space Station. SpaceX on Saturday (March 2) launched its first Crew Dragon on a uncrewed test flight to demonstrate its ability to safely fly to and from the space station, prior to doing the same with NASA astronauts on board. 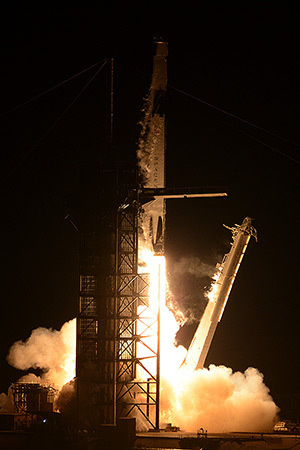 The Demo-1 (DM-1) Dragon lifted off atop a SpaceX Falcon 9 rocket at 2:49 a.m. EST (0749 GMT) from Pad 39A at the Kennedy Space Center in Florida. "Tonight was a big night for the United States of America, a great night for NASA. What today really represents is a new era in spaceflight," said NASA Administrator Jim Bridenstine at a post-launch press conference. The early morning launch, which culminated in the Crew Dragon being deployed into Earth orbit 11 minutes after liftoff, set up a scheduled rendezvous with the space station approximately 24 hours later on Sunday. SpaceX flight controllers oversaw the vehicle's ascent from Firing Room 4 inside NASA's Launch Control Center (LCC), continuing the room's Apollo and space shuttle program-use legacy. "That was super stressful, but it worked so far. We have to dock to station and come back, but so far it has worked. We have passed some of the riskiest items," said SpaceX CEO Elon Musk. First revealed in 2014, SpaceX's Crew Dragon builds off the capsule design that the Hawthorne, California-based company has been using to fly cargo for NASA for seven years. The Crew Dragon adds an environmental control and life support system and a launch escape system, the latter capable of carrying the Dragon to safety during its climb to orbit or in the event of a catastrophic problem on the pad. "Early Dragon 1 had a window on the side and this was clearly a hint to everybody that we wanted to fly humans into space," said Hans Koenigsmann, SpaceX's vice president for build and flight reliability, at a pre-launch press conference on Thursday. "We want to do this, this is our goal, this is why we are actually here. So clearly this is super important for us and incredible." For DM-1, the Crew Dragon is transporting 450 pounds (200 kilograms) of supplies and equipment for the space station's Expedition 58 crew. 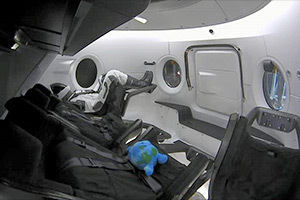 In addition, the capsule is loaded with mass simulators and is carrying an anthropomorphic test device (ATD), a "dummy" fitted with sensors around its head, neck and spine to gather data ahead of SpaceX's second Crew Dragon demo mission, DM-2, with NASA astronauts on board. "With respect to the 'dummy,' it's actually a smarty, right? It has lots of sensors, so we call it a smarty," said Koenigsmann, adding that the ATD was dubbed "Ripley" after actress Sigourney Weaver's character in the "Alien" movie franchise. Live camera views from on board the Dragon provided a look at Ripley, garbed in SpaceX's black and white spacesuit and strapped into one of the spacecraft's four seats, during the launch. The broadcast also showed a small plush toy Earth with a face, hands and feet placed there to float loose in the cabin. "Super high tech zero-g indicator added just before launch!" joked Musk on Twitter prior to the launch. Once the Dragon catches up with the space station in orbit, it will execute a series of autonomous maneuvers to approach a link up with an international docking adapter (IDA) mounted to the end of the station's space shuttle-era Pressurized Mating Adapter-2 (PMA-2). "On the approach, the vehicle will come in to about 150 meters [490 feet] on the V-bar [Velocity-bar or vector]," said Joel Montalbano, NASA's space station program deputy manager. "As it comes a little closer, the [space station's] crew will test a retreat command. The vehicle will move back out to about 180 meters [590 feet] or so and sit there for about ten minutes. This is all part of the testing we do to insure the safety of the space station." "Then [the Dragon] be commanded in," he explained. "It will do one more stop at about 20 meters [65 feet] for a little bit. Again, just to do some testing, making sure everything is good to go. Then it will come in for docking." About two hours after the Dragon arrives at the space station, Expedition 58 flight engineer Anne McClain of NASA and commander Oleg Kononenko of Roscosmos will open the spacecraft's hatch, beginning five days of docked operations. The Crew Dragon is slated to undock from the space station on Friday (March 8) at approximately 2:30 a.m. EST (0730 GMT). About five hours later, the spacecraft will conduct a 15-minute de-orbit burn, beginning its return to Earth. The capsule will re-enter the atmosphere, deploy parachutes and splash down in the Atlantic Ocean off the coast of Florida at about 8:45 a.m. EST (1345 GMT), marking SpaceX's first Dragon recovery on the east coast of the United States. Pending the DM-1 mission going as planned, SpaceX is scheduled to conduct an in-flight abort test using the same spacecraft later this spring. The DM-2 crewed mission would then follow, flying NASA astronauts Bob Behnken and Doug Hurleyfor a short duration visit to the space station no earlier than June. "We are taking the opportunity with this Demo-1 flight to learn all that we can in preparation for our upcoming crewed flight," said Hurley. "It really is our chance, not to be on board, but to be with the rest of the team that will support us when we fly on the vehicle." The astronauts assigned to fly SpaceX’s Crew Dragon spacecraft beginning later this year said Friday they are excited for the capsule’s first orbital mission set for launch Saturday, but significant work remains before the ship is cleared to carry people. 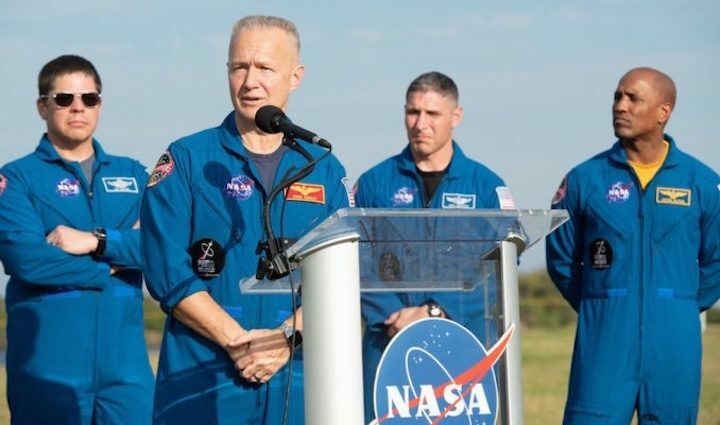 “There’s something really exciting about being first, getting to fly a crewed mission coming out of this,” said Bob Behnken, a veteran astronaut assigned to join NASA crewmate Doug Hurley on the Crew Dragon’s first trip to space with humans on-board later this year. The Crew Dragon spacecraft — the product of a multibillion-dollar public-private partnership between NASA and SpaceX — is poised to launch into orbit for the first time Saturday at 2:49 a.m. EST (0749 GMT) from pad 39A at the Kennedy Space Center in Florida. 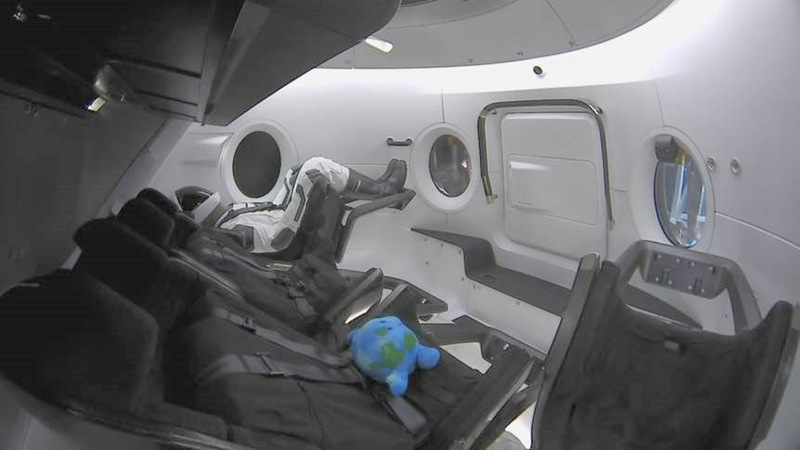 The only passenger aboard the Crew Dragon during Saturday’s launch is an instrumented mannequin named “Ripley,” which is positioned in one of four seats inside the ship’s pressurized crew compartment. 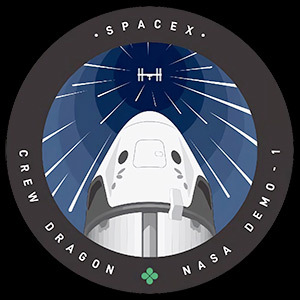 SpaceX and NASA engineers will use the Crew Dragon’s six-day mission to and from the International Space Station — known as Demo-1 or DM-1 — to collect data on the capsule’s performance, safety and reliability. NASA and SpaceX have officially targeted Behknen and Hurley’s flight — called Demo-2 or DM-2 — for no earlier than July, but officials consider that schedule optimistic, assuming a smooth unpiloted Crew Dragon test flight, a seamless turnaround of the Demo-1 capsule for an in-flight abort to test the ship’s escape thrusters, and the closeout of several unresolved technical concerns NASA says must be addressed before its astronauts can fly. As a hedge against additional delays, the U.S. space agency is considering purchasing two more seats from Russia to allow its astronauts to launch to the space station on Soyuz spacecraft in late 2019 and early 2020. Once SpaceX’s Crew Dragon and Boeing’s CST-100 Starliner, another capsule funded by NASA, accomplish their unpiloted and crewed test flights, both spacecraft can commence regular crew rotation missions to the station, ending U.S. reliance on Russian Soyuz capsules for transportation to and from low Earth orbit. NASA is also weighing an option to extend Boeing’s crewed test flight, with three astronauts on-board, from a short stay to a long-duration mission lasting multiple months. The longer mission could help ensure U.S. astronauts remain on the station — a major concern of NASA managers — in the event of further delays in certifying the Crew Dragon and Starliner for operational flights. NASA Administrator Jim Bridenstine said Friday he remains confident U.S. astronauts will launch on at least one of the commercial crew capsules before the end of the year. The crewed test flights will be the first time a U.S. spacecraft has launched into orbit with astronauts since the retirement of the space shuttle in 2011. Engineers will analyze data gathered on the Demo-1 test flight, searching for areas that might need improvement before crews board the spaceship. NASA astronauts Mike Hopkins and Victor Glover will launch on the Crew Dragon’s first regular crew ferry mission to the station after Behnken and Hurley’s test flight. Hopkins and Glover are slated to spend around six months aboard the orbiting research complex, then return to Earth on the Crew Dragon. 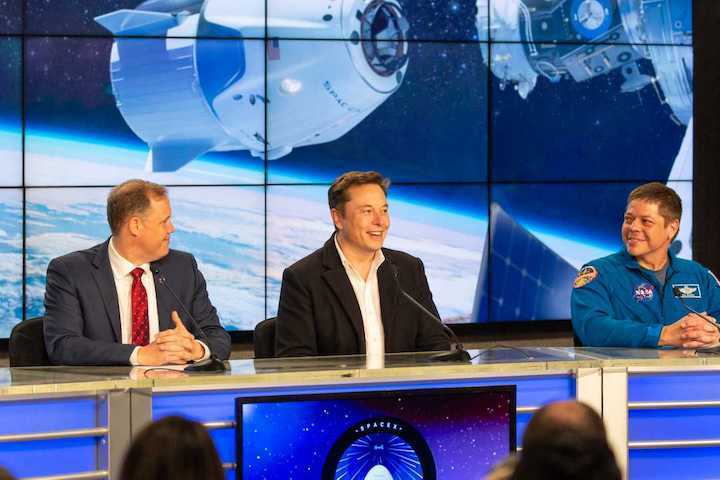 Hopkins said astronauts — if asked — would be ready to fly on Crew Dragon, but added that it is important to send the ship to space on a demonstration mission before adding humans to the mix. NASA launched the space shuttle on its first flight with two astronauts on-board, breaking with the convention followed in the Mercury, Gemini and Apollo programs of sending up spacecraft without people. The Crew Dragon will splash down in the Atlantic Ocean — around 240 miles (390 kilometers) east of Cape Canaveral — to wrap up the Demo-1 mission March 8. A SpaceX recovery ship will retrieve the capsule from the sea and return it to port. SpaceX aims to reuse the capsule for an in-flight abort test, tentatively scheduled for June, to verify the performance of the ship’s escape engines. The in-flight abort test will verify the Crew Dragon’s SuperDraco escape thrusters can push the capsule away from a failing rocket, a safety feature designed to ensure astronauts survive a launch accident. Eight SuperDraco rocket engines mounted in pods around the circumference of the Crew Dragon are programmed to quickly fire if computers detect an emergency during launch. NASA and SpaceX want to ensure the escape system is up to the job before putting astronauts on the spacecraft. SpaceX tested the abort system during an on-pad test in 2015, demonstrating the SuperDracos have the power to drive the spacecraft off its rocket sitting on the ground in the event of an accident during the countdown. For the Demo-1 mission, the escape system is operating with reduced functionality to gather data. An on-board computer will track the health, orientation and rates of the Falcon 9 rocket during its climb into orbit, with safety triggers relaxed to ensure the escape system does not inadvertently activate during the launch. “You have certain parameters, like a rate, or angular position, at certain limits, but for crew, you would cut it maybe a little bit closer, just to make sure it’s safer, and it triggers earlier,” said Hans Koenigsmann, SpaceX’s vice president of build and flight reliability. Crew Dragon’s life support system, including air revitalization equipment to regulate oxygen and carbon dioxide inside the spaceship, will be up and running on the Demo-1 mission. The crew seats and display monitors will also fly. But some equipment, such as crew controls, push buttons and the toilet, are not on the Crew Dragon on the Demo-1 test flight. SpaceX will add those components for the first mission with astronauts. Engineers are also still assessing concerns with high-pressure helium tanks — known as composite overwrapped pressure vessels, or COPVs — parachutes and thrusters, according to Gerstenmaier. The COPVs contain helium pressurant for the Falcon 9’s propellant tanks, and SpaceX introduced an upgraded helium reservoir that began flying on the rocket late last year. The new COPV design — dubbed COPV 2.0 — includes fixes intended to avoid friction in the fibers on the outside of the tank, which engineers believe could create a spark. Investigators probing the explosion of a Falcon 9 rocket on its launch pad in 2016 blamed the accident on a spark generated from a helium vessel inside the vehicle’s upper stage liquid oxygen tank. More than two years after the 2016 accident, Gerstenmaier said engineers are still working to understand how friction on the outside of a COPV could spark such a catastrophic explosion. “The way we do things in human spaceflight is we need to not only meet the design, but we need to understand physically which parameters are driving a bad outcome,” Gerstenmaier said. “So, for example, what are the ignition parameters that can cause a COPV to ignite, and then we need to show physical controls in how we prevent those individual physical parameters from contributing to the final event. “I think we’ve done … the statistical analysis that says this is a very low probability event,” Gerstenmaier said. “It’s not going happen very often, but now we are going through what are the physics behind that? What could be an ignition source? While there are several technical issues NASA wants to resolve before the Crew Dragon carries astronauts, officials approved plans to go ahead with the unpiloted demo flight. “We’re working several other things on this vehicle that we just discovered, so I would say the vehicle is not fully qualified,” Gerstenmaier said. “In other words, we haven’t set the total envelope of where some of the hardware can operate and how it can be used, but we know the hardware is good enough to go do this demonstration flight. In fact, we want it to go to flight to see if there’s something else we missed. Drop testing of a Crew Dragon mock-up continues to collect data on the ship’s four parachutes, and engineers are modifying part of the capsule’s propulsion system to address a vibration concern with the ship’s Draco thrusters, used for orbital adjustments and attitude control. “We’re looking at the physical parameters of how the chutes operate. Have we covered all the corners of the envelope in testing? So the teams are still doing prachute drops. They’re still doing parachute testing. That needs to be completed,” Gerstenmaier said. NASA and SpaceX officials said the Draco thruster concern is centered on how the rocket jets behave when cold propellants are injected into them. The Crew Dragon carries 16 Draco rocket thrusters, burning a hypergolic mixture of hydrazine and nitrogen tetroxide propellants. 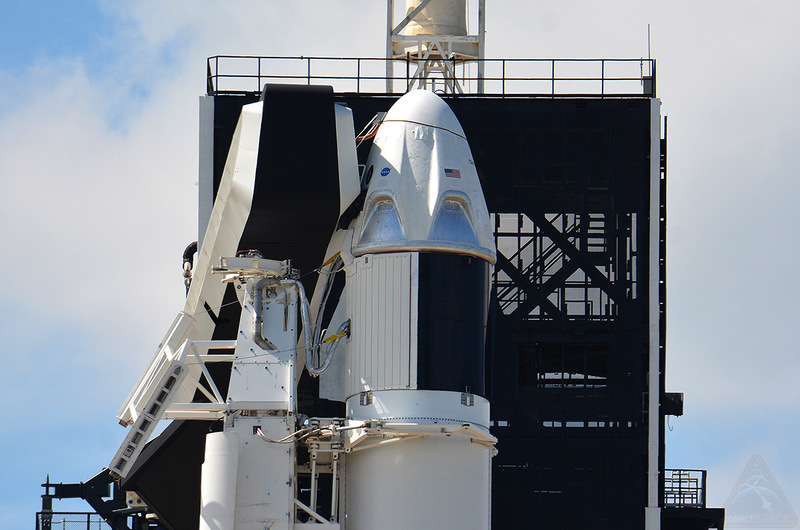 On the Demo-1 flight, ground controllers will keep the Crew Dragon in orientations to ensure the propellant tanks remain illuminated and heated by the sun. When docked to the station, controllers can keep the propellants warm by managing the power load inside the spacecraft, according to Koenigsmann. “The thruster shock can be so strong that it damages the thruster, so physical damage. But it’s super unlikely. We’ve had 16 (Dragon cargo) missions. It’s the same thruster,” Koenigsmann said.